The math section had 60 questions. I knew the answers to none of them, but managed to guess ten out of the 60 correctly. On the reading test, I got 62%. In our system, that’s a “D”, and would get me a mandatory assignment to a double block of reading instruction. It seems to me something is seriously wrong. I have a bachelor of science degree, two masters degrees, and 15 credit hours toward a doctorate. I help oversee an organization with 22,000 employees and a $3 billion operations and capital budget, and am able to make sense of complex data related to those responsibilities. I have a wide circle of friends in various professions. Since taking the test, I’ve detailed its contents as best I can to many of them, particularly the math section, which does more than its share of shoving students in our system out of school and on to the street. Not a single one of them said that the math I described was necessary in their profession. It might be argued that I’ve been out of school too long, that if I’d actually been in the 10th grade prior to taking the test, the material would have been fresh. But doesn’t that miss the point? A test that can determine a student’s future life chances should surely relate in some practical way to the requirements of life. I can’t see how that could possibly be true of the test I took. It makes no sense to me that a test with the potential for shaping a student’s entire future has so little apparent relevance to adult, real-world functioning. Who decided the kind of questions and their level of difficulty? Using what criteria? To whom did they have to defend their decisions? As subject-matter specialists, how qualified were they to make general judgments about the needs of this state’s children in a future they can’t possibly predict? Who set the pass-fail ‘cut score’? How? 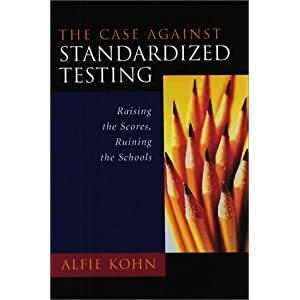 I can’t escape the conclusion that decisions about the [state test] in particular and standardized tests in general are being made by individuals who lack perspective and aren’t really accountable. What Mr. Roach started by taking the test and publishing his results is actually a grassroots Twitterstorm tagged #takethetest: people are now challenging their own politicians to take their local standardized tests and publicize the result. Joe Bower actually managed to get Alberta’s Minister of Education Thomas Lukaszuk to respond to his challenge on Twitter (see a screenshot of the conversation); whether he’ll take the test or not remains to be seen. Will you challenge your local politician to take the test? I wonder if any will respond? Movie Monday: Born to Learn!